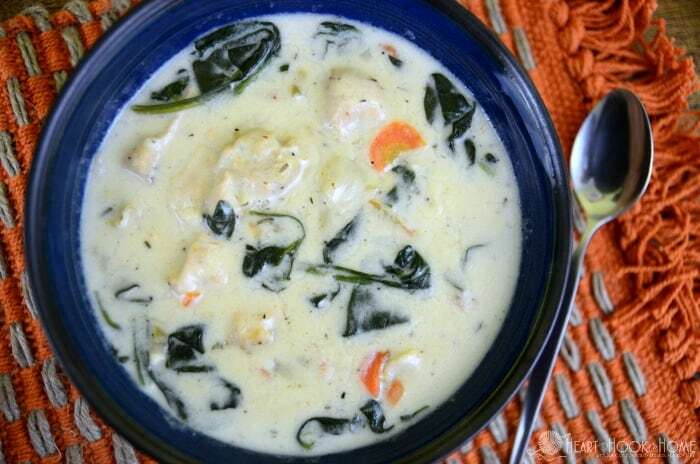 Nothing better than homemade dumplings, and this Creamy Chicken, Spinach, and Dumpling soup is a hit! There’s something about homemade chicken and dumplings that warms the soul. These made-from-scratch dumplings are cooked to perfection; a perfectly doughy consistency in bite-sized pieces. My two boys love this new recipe, my oldest says its the best thing he’s ever had and requested it at least once a week. We can do that! Get the printable version of this Chicken, Spinach, and Dumpling recipe below. First you’ll want to cook your chicken breasts using whatever method you’d like. My preferred method is to boil bone-in breasts for approximately 20 minutes. Take the cooked chicken and either cube or shred it and set it aside. Chop up your carrots, onion, celery and garlic. Heat the oil and butter in a large skillet over medium high heat. Add the veggies and cook until they start to soften, stirring frequently. While there’s still a thin layer of butter on the bottom of the skillet go ahead and quickly stir the flour into the vegetable mixture. Then slowly add the milk while continuously stirring. Cook on medium high until the mixture starts to thicken and then add the broth, heavy cream and seasoning. Reduce heat to low, cover and simmer. While simmering, in a bowl combine flour, baking powder, sugar, salt, Italian seasoning and then cut in your butter with a fork. You should end up with little crumbles of butter throughout the flour. Add milk and stir together until you end up with a ball of dough. Place the dough in a ziploc bag and using scissors cut a small pea-sized corner off. Slowly squeeze a small amount of dough out, cut it with scissors and let it fall into the pan. Repeat until all the dough is gone. Combine the chicken, soup and fresh spinach and simmer for an additional 7-10 mins. Or until the dumplings are thoroughly cooked. Salt and pepper to taste. Cook chicken breasts using whatever method you prefer and either cube or shred it. Set aside. Chop up your carrots, onion, garlic and celery. Heat the oil and butter in a large skillet over medium high heat. Add the veggies and cook until they start to soften, stirring frequently. While there’s still a thin layer of butter on the bottom of the skillet go ahead and quickly stir the flour into the vegetable mixture. Slowly add the milk while continuously stirring. Cook on medium high until the mixture starts to thicken and then add the broth, heavy cream and seasoning. Reduce heat to low, cover and simmer. While simmering, in a bowl combine flour, baking powder, sugar, salt, Italian seasoning and then cut in your butter. You should end up with little crumbles of butter throughout the flour once done. Add milk and stir together. Place the dough in a Ziploc bag and using scissors cut a small pea-sized corner off. Slowly squeeze a small amount of dough out, cut it with scissors and let it fall into the pan. Repeat until all the dough is gone. Combine the chicken, soup and fresh spinach and simmer for an additional 7-10 mins - or until the dumplings are thoroughly cooked. Salt and pepper to taste. 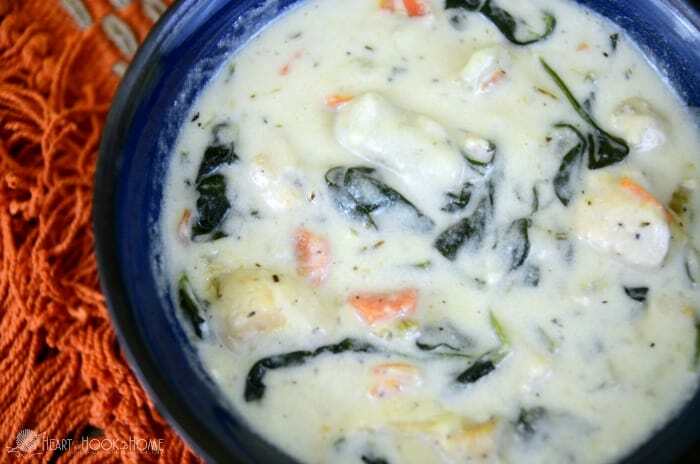 When you try this Creamy Chicken, Spinach, & Homemade Dumpling Soup let us know what you think!